Love these Bengali potatoes. 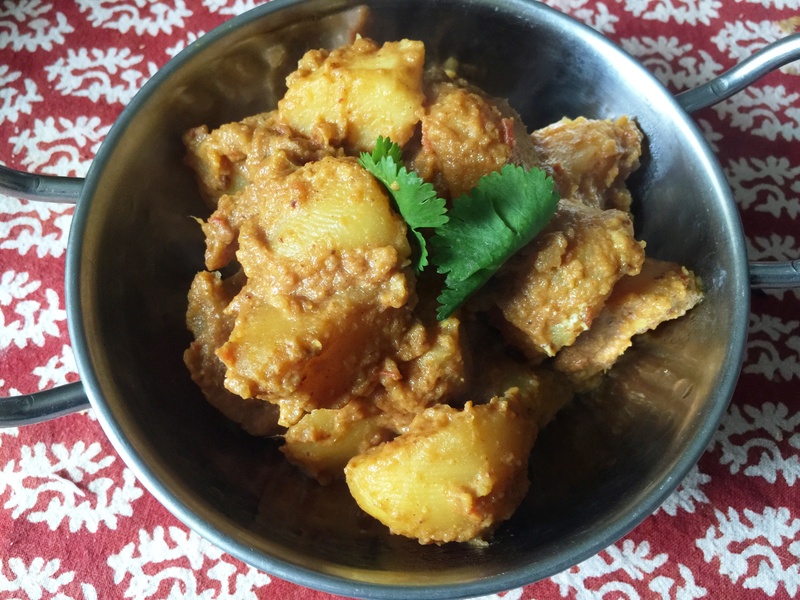 Dum aloo translates to slow cooked potatoes, but this doesn’t take too much time since I parboiled the potatoes. Dum aloo is often made with whole tiny potatoes, but I only had small so I cut them into fourths. Frying in mustard oil is common in Bengali recipes and delicious! Enjoy! Parboil potatoes. Don’t cook too much since they will be cooked with the gravy later on. You can do what I did and overcook them, then save them for something else while you make a new batch! Pan fry the potatoes in mustard oil until a little crisp on the outside, the remove from pan. In a coffee or spice grinder, grind the cinnamon, cardamon, and cloves with the chili powder, coriander powder, turmeric and cumin powder. In a food processor or mixie, grind the onions, ginger, garlic, and green chilis, then remove to a bowl. Then grind the tomato separately. In the pan the potatoes were fried in, add the rest of the mustard oil and fry the onion mixture until the raw smell goes away. Add the spices and cook for a few minutes, then add the tomatoes and cook for a few more minutes. Add the potatoes, salt to taste and cook for 15 minutes or so to let the flavors meld.